I am a fairly free form art quilt designer and often don’t know what size wall quilt I will end up with until it is finished. This is a challenge I have mastered with custom quilts where I more carefully plan the dimensions and proportions. But when I am experimenting with a new design or just having fun with fabric and colors, the quilt may end up a size unanticipated in my original plans. After two years of selling art quilts I have learned that I need more small art quilts in my inventory. I define SMALL as 2 square feet or less. This is for two reasons: one, people may only have a small space for a piece of art, and the second being price point – I can sell smaller quilts for less money. 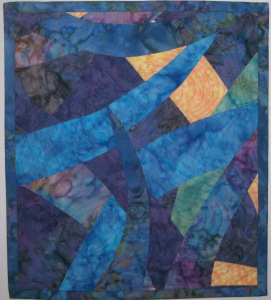 Making a small contemporary art quilt is not as easy as downsizing larger designs. I spent some time last fall working on some smaller designs. As with my medium and larger quilts, I aim for pleasing color combinations, interesting design, and an overall final product that invites you to study and enjoy it. One of my successes was a small sunset quilt which I designed on the vertical and not the horizontal, the latter being my typical style. This quilt titled “As the Sun Sets” is 10″ wide x 18″ high. 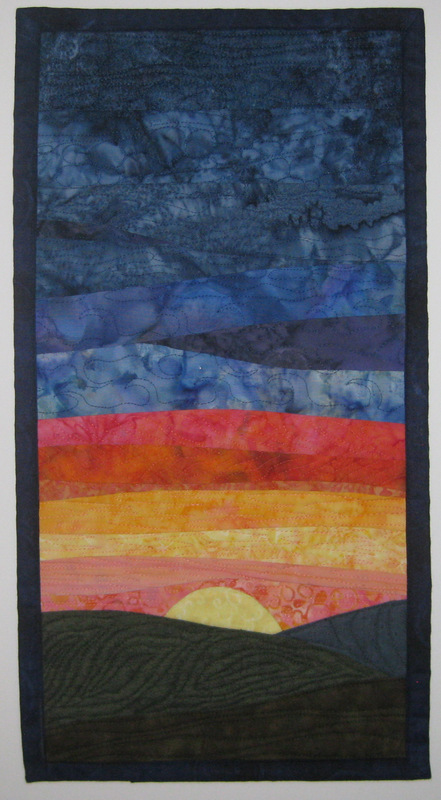 The vertical rectangle design as seen in the attached photo creates a quilt which is a slice of the sunset from horizon to the darkest sky. I had fun using a variety of free motion quilting designs on the small quilt too which gives it some depth and texture. You can see this stitching on my Etsy site if you select to look at this quilt. These same free motion stitches might be overwhelming on a larger, horizontal orientation where I have more complexity in fabric piecing but in a smaller quilt these variations work well. Another success was a downsizing effort of a large quilt. I enjoy multi colored mosaic quilts, playing with different colors, blending from one to another. I used smaller pieces of the different colors and less pieces b ut I had to map out my downsizing plan on graph paper in order to keep it from expanding on my design wall which has happened with past efforts!! The small version is 15″ wide x 18″ high and has a color progression which is slightly different. Both the larger original one and the smaller one sold quite quickly but can be seen in my Gallery on this website. A third successful design is a layering with curved pieces of fabric. 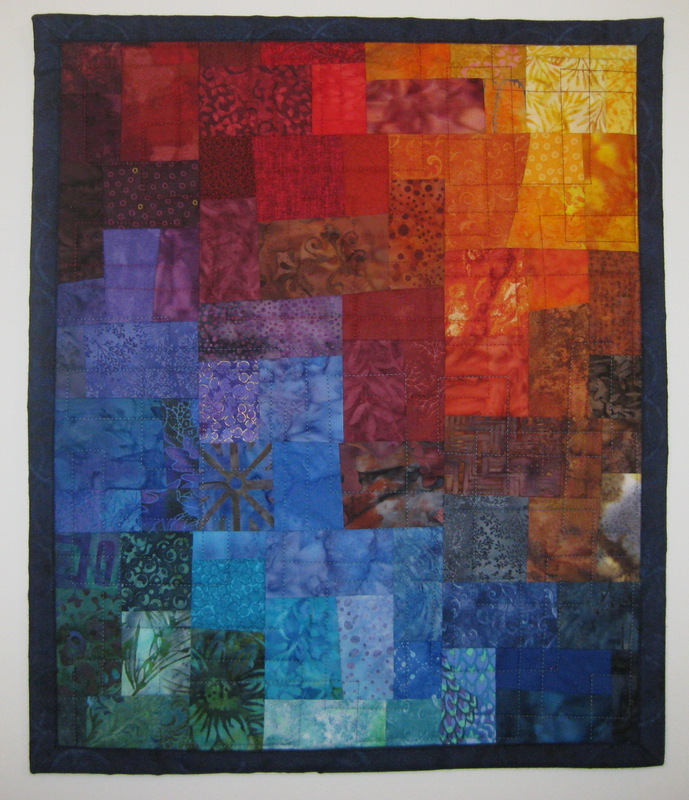 See the photo of the blue small quilt which seems to have fabric layered on top of each other, creating some depth in the quilt. This quilt started out larger but as I finished it, the section of the quilt I liked the best was what you see so I trimmed it down into a small quilt, which is 16″ wide x 18″ high. Sometimes you just don’t know where you will end up with an art quilt! I have made smaller tree/woods motif designs also which work well. Smaller quilts sold well over the holidays as gifts so I know I’m onto something.